They'll start rolling out in the coming weeks. When you finish watching something on Netflix, do you rate it? Maybe you'll sit (or stand) there, with all of that responsibility on your shoulders, for much longer than you need deciding whether that movie or TV show really deserves the coveted five stars. In the coming weeks, there will be a little less pressure on you to perform, because the streaming giant is scrapping the time-tested classification in favour or something a little more familiar: the thumbs up. Variety reports that Netflix first introduced the new thumbs up and down ratings with hundreds of thousands of subscribers in 2016. The A/B tests showed that the new classification got 200 percent more ratings than the star-based system. 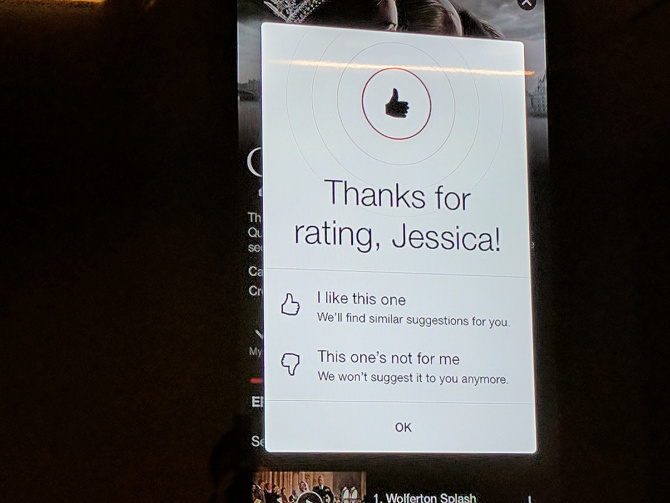 Although they'll no longer be visible, the metadata from past star ratings will continue to be used to personalize viewing profiles (Netflix has already registered over 10 billion five-star ratings after all). The reason behind the switch is two-fold: subscribers who regularly score movies and TV shows have already done a pretty good job of helping Netflix learn what users are interested in. The other is relevancy: Netflix VP of Product Todd Yellin told Variety that viewers would often rate documentaries higher than funny movies, but watch comedies more regularly than other high-rated content. The end result is a system that users are intimately familiar with. Two of the biggest websites -- Facebook and YouTube -- both allow users to 'like' posts and uploads with a thumbs up. "We made ratings less important because the implicit signal of your behavior is more important," Yellin said.